The photo above is Samri Baldwin and Harry Houdini. Baldwin was born Samuel Baldwin in Cincinnati OH in 1848. He performed professional as The White Mahatma. Samri is credited with taking the question and answer techniques used by mediums and applying them to magic and mentalism. His techniques are still used today. I'm not sure, but I might have stumbled upon a discovery*. I believe it was in Jim Steinmeyer's book about Howard Thurston where I read that Samri Baldwin in 1921 had a small spot in the Thurston Show. 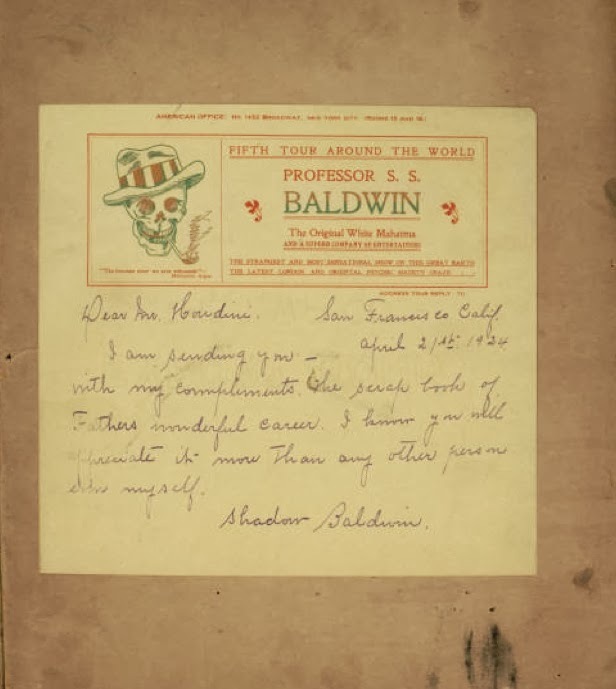 Baldwin had brought along with him a trunk full of treasures he had collected over the course of his career and life. They were to be a gift to Howard Thurston. But there was a problem, the two did not get along. So much for that gift! I kind of assumed at that point that Baldwin probably gave or bequeathed the trunk to his daughter Blanche Baldwin, though I had no real proof either way. Well, yesterday I'm looking through some of the scrapbooks in the Harry Ransom Houdini Collection and what should pop up? 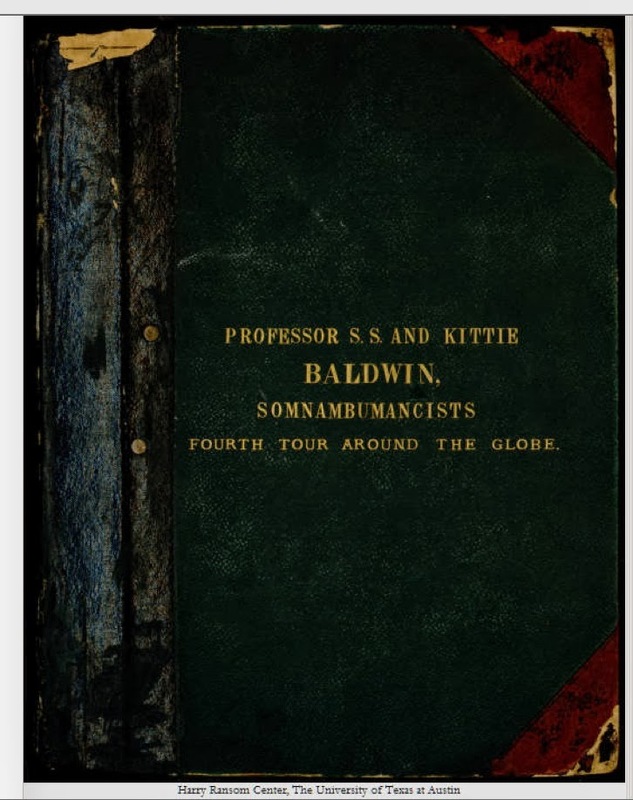 A scrapbook belonging to S.S. and Kittie Baldwin! Now this is not the trunk full of treasures that was mentioned in the Thurston book, but I bet it was part of that trunk! As it turns out, my discovery, or what I thought was a discovery falls flat near the end. Samri Baldwin did not give the scrapbook to Houdini. His daughter gave the book to Houdini, as can be seen by the inscription in the front. 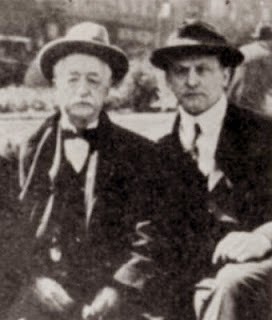 Samri died March 10th, 1924 and on April 21st, the book was sent to Houdini. So the trunk of treasures remained with the family with the exception of this scrapbook. Or maybe she gave them to someone else? Where the trunk of treasures ended up is anyone's guess. *Turns out this 'discovery' has been made before. And as is mentioned in the comments below, was also revealed in the book 'Metamorphosis' by Bruce MacNab. The only unique thing that I did was make the connection of the book to the trunk of memorabilia mentioned in the Thurston book by Jim Steinmeyer, but his is only a guess on my part. Thanks Dean! BTW: In Bruce MacNab’s book, The Metamorphosis, which I just re-read while on vacation, there is a nice chapter titled: “Houdini Meets the White Mahatma”. Joe, OMG, thank you for that!!!! I'm reading the book now but have not gotten to that chapter. Very excited to read this now!!!! Very excited to find this. Samuel Spencer Baldwin is son of my 4th great Aunt. Which makes him my 1st cousin 4x removed. I was very excited to read and see photos of him and Kitty. His mother was Rhoda Locke Spencer father was James Henry Baldwin. I always love when a relative of a famous magician finds my blog. Thanks for your comments! Decades ago in San Francisco, there was a collectable store, Robert Kuhn antiques, that had a number of letters from Houdini to Shadow. They were written after Samri had died. 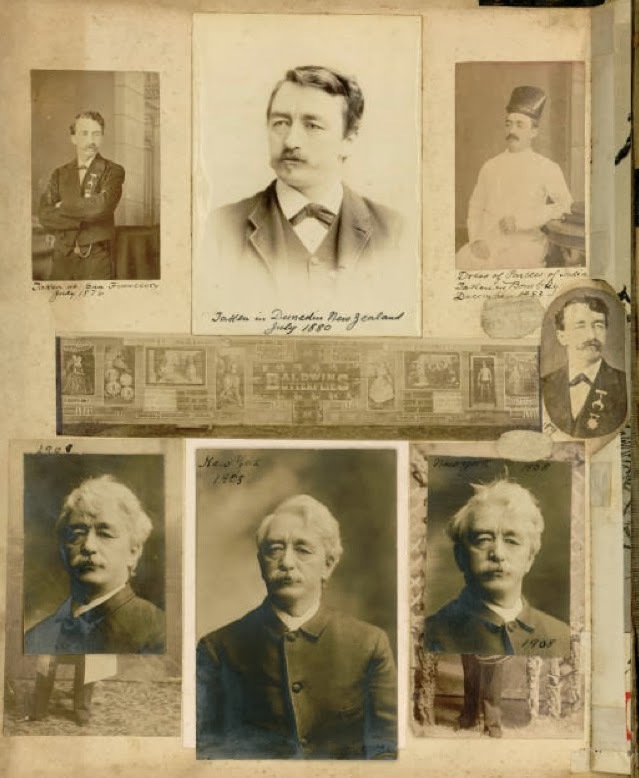 Also a large photo and a scrapbook of Baldwin. I bought the letters and photo, the scrapbook bought by someone else before I could bring the money to get that too. (scrapbook was $35!) In the letters, Houdini speaks with great affection of his friend and conveys his feelings of his regard for Samri and Shadow. I went to the address on the letters on Sacramento Street in San Francisco....the area between Pacific Heights and closer to the Fillmore district. The residents had no knowledge of the Baldwins. They said the area at one time, had many Americans of Japanese ancestry living there, but during WW2, but were forced out and incarcerated. Fascinating! Can you believe that, $35 for a scrapbook with that much historical significance. Of course, that was decades ago as you mentioned, but still. Thanks again for sharing! I just bought a second edition of Jane Eyre, published by John Lovell. It has a signature on the 2nd page of S. S. Baldwin 1894. I am trying to authenticate this signature. Could this possibly be the same S. S. Baldwin? Bought in Texas. I'd say there is a very good chance it's Samri Baldwin!